Our previous post was focused on identifying and understanding Canada’s favourite coffee shop. This post digs into how Canadians enjoy their coffee at home. It is a rapidly changing sector with new coffee brands appearing daily, growing interest in making specialty drinks at home, and suppliers like Keurig, Nespresso and Tassimo disrupting how it is prepared. We asked our users across Canada for their thoughts and preferences around this interesting topic. 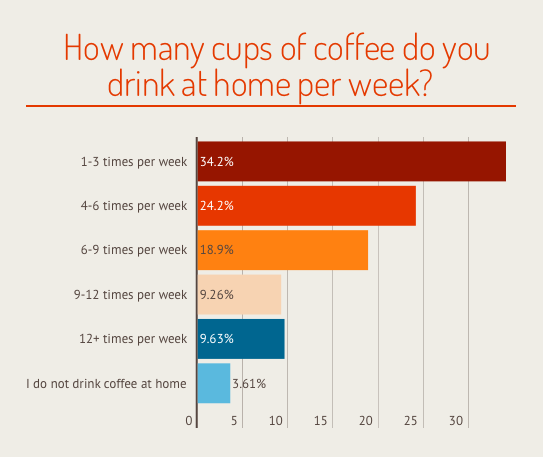 We asked how many times a week the respondents are drinking coffee at home. Most of them enjoy coffee 1–3 times per week (34.2%). 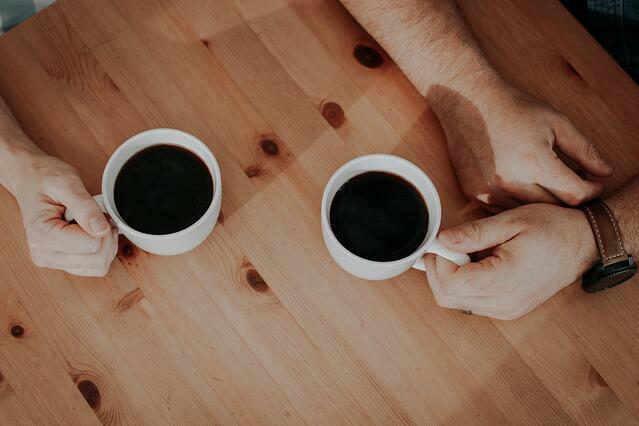 The second most reported preference was 4–6 times per week (24.2%), which still falls under Health Canada’s advised healthy limits of daily caffeine intake (400 milligrams, or the equivalent of three 8-ounce cups of coffee). How Do We Make Our Coffee? 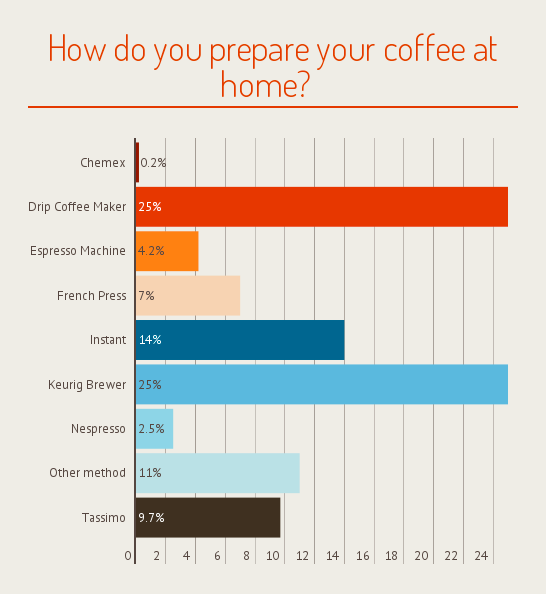 We asked about how Canadians are preparing coffee at home, and specifically which coffee machines they are using. Keurig Brewer has become the leader brand in the category of personal brewers, preferred by 25% respondents. Drip coffee maker also remains the popular go-to choice for a lot of coffee lovers (25%), as it’s automatic brewing is the easiest way to get a caffeine fix at home. Another trend uncovered is that instant coffee stays stable despite the increasing popularity of other methods. It is still preferred by 14% of respondents for its convenience. What Do We Make At Home? We wanted to know if we Canadians make any speciality coffees at home. 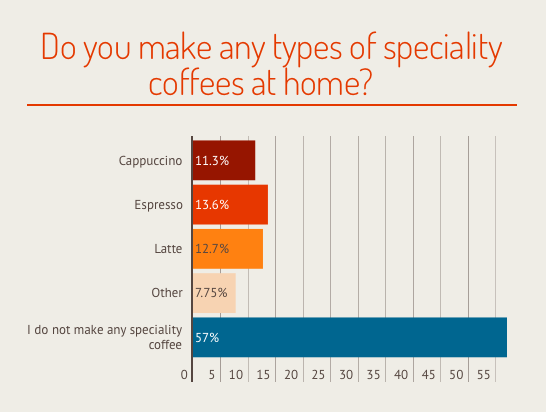 57% of respondents like to make the usual drip coffee at home. The second favourite is espresso (13.6%), followed by latte (12.7%). We wanted to find out whether Canadians are choosing to grind their own beans at home. As the data demonstrates, the majority of us (75%) prefer to bring home already grinded coffee, and leave the grinding job to the coffee producers, importers and baristas. Which brands win our choice? We prefer the Canadian ritual of Tim Hortons (14.9%) even at home, but we also enjoy the convenience of Maxwell House instant coffee (12.7%), and the popularity of Starbucks coffee stores got us addicted to its taste, so we are buying Starbucks coffee for home as well (10.7%). Folgers Coffee (10,6%)comes up as a deserving fourth preferred brand as the range of varieties it offers is unrivalled. Where do we get our coffee? 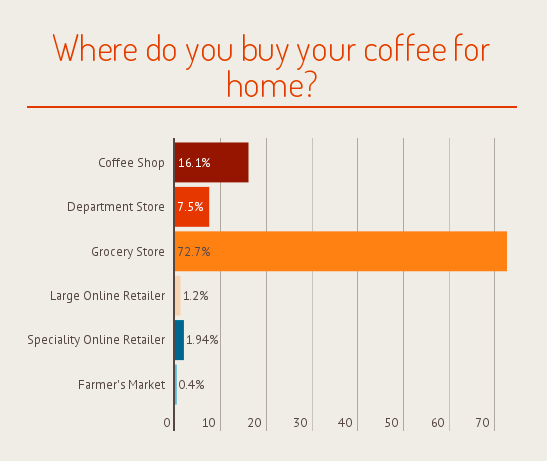 Here convenience beats all again, grocery store being the number one place where we get our coffee from (72.7%). The second place is the coffee shop (16.1%), where we perhaps enjoy the cup of coffee while our coffee for home is grinded, and the third place is the department store (7.5%). 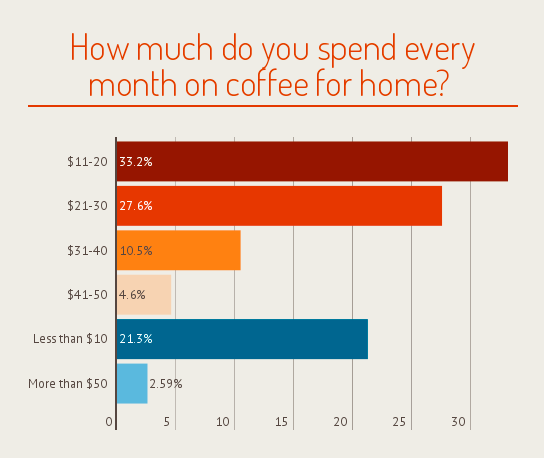 To discover if the spending on coffee differs between us Canadians, we asked how much our respondents spend every month on coffee for home. The majority of us (33.2%) report to spending $11–20 every month, followed by $21–30 (27.6%) and less than $10 (21.3%). 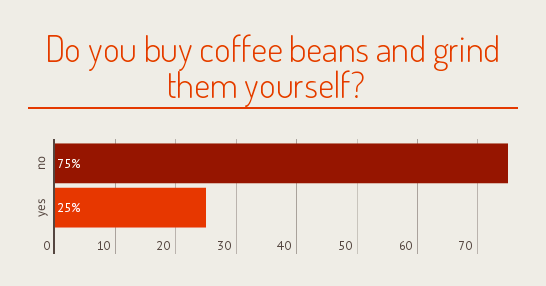 Some 2.59% of us like to break the bank on our coffee, spending more than $50 per month. These are the insights on the coffee drinking and consumption habits of Canadians, collected from a sample of 1079 adults across Canada. This research was completed through our crowdsourcing platform Bounty. If you are looking for insights around your brand or brand category, contact us via sales@twentify.com.